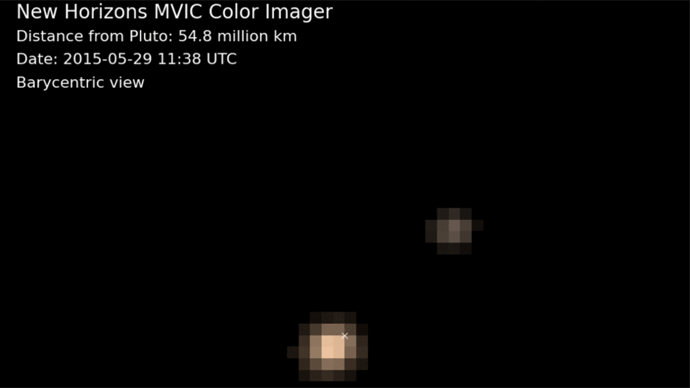 The US space agency has published the first 'near-true color' images of the remote dwarf planet Pluto and its largest satellite taken by the New Horizons telescope. The picture quality leaves much to be desired, but NASA promises the best is yet to come. NASA has compiled a number of photographs from its New Horizons mission on the approach to the icy dwarf planet. The series pictures were taken over the course of five days in three colors: blue, red and near-infrared. They were then put together to make two looped movies, showing Pluto and its largest satellite, Charon. Pluto is a dwarf planet, only about one-sixth of Earth’s size, which is why it was excluded from the list of Solar System's "proper" planets in 2006, when the definition of "planet" was reviewed. It does orbit the sun, though, and is one of the largest bodies in the Kuiper belt - a ring of space debris left over from the Solar System's formation, beyond the orbit of Neptune. It has five known moons, the largest of which, Charon, is sometimes dubbed Pluto's "twin planet": the two appear to orbit each other around a common center of gravity. One of the videos NASA released shows that rotation, with the center of gravity marked with an X. The center is much closer to Pluto due to the planet's larger mass compared to Charon. The resolution will get better, NASA specialists promise, as the New Horizons spacecraft approaches Pluto. It is set to come as close as 12,500 kilometers to the surface on July 14 this year. New Horizons is the first mission to Pluto in history. It is managed by the Johns Hopkins University Applied Physics Laboratory.